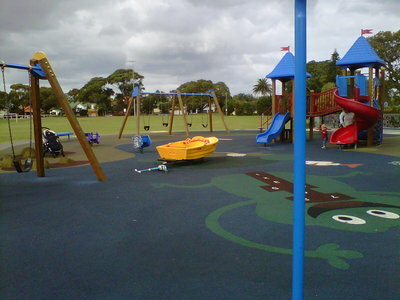 Expansive Booralee Park in Botany offers two playgrounds on its grounds. The larger, newer one is at the top of Daniel Street. 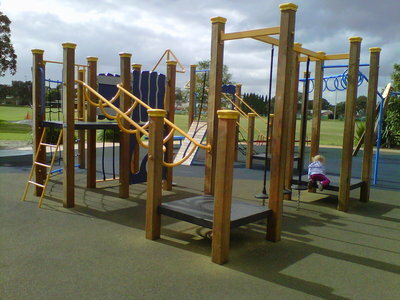 It features a large play structure with rope ladders, rope climbs and hanging bars which are suitable for older children; another large adventure play climbing structure with two slides; a large spider-rope climb, two sets of swings and a sit-in-boat. A beginner's bike track runs around the outside of it, perfect if your kids are just learning how to ride. The park is in full sun, and the whole area is carpeted with that springy rubber stuff which can reflect the glare, so pack a hat. 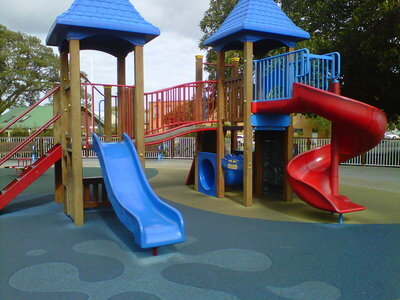 The park is most suitable for older toddlers up. There is also an undercover picnic area near the large playground. The smaller park is located on Bay Street. 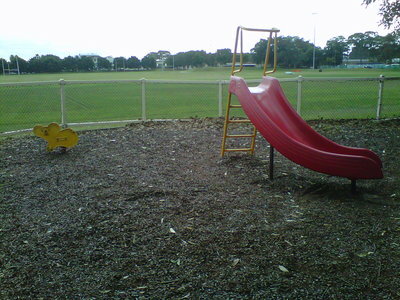 It is a much older park, and looks a bit worse for wear. 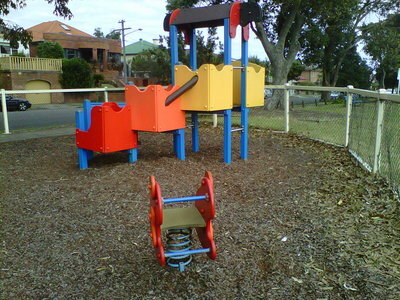 It features a slide, swing-set and an old climbing structure. Its best feature is that it is fully fenced with a lockable gate, so you can sit on the benches without worrying your child will run off. Parking: Very Easy. There is a dedicated parking bay right in front of the larger play area (at the very end of Daniel Street). For the smaller park, you can park on Bay Street, right in front of it. Coffee / Refreshments: Nothing nearby. Head back to Botany Road. Toilets: About 5 metres from the larger play area. About 100 metres from the smaller play area. Shade: The larger play area is in full sun. Pack a hat. The smaller play area has some shade over the swings. Fenced: Large playground: only on Daniel Street side; not enclosed. Small Playground: fully enclosed with a lockable gate. Verdict: The large playground on Daniel Street is great for older kids, or to test out a first bike. The small playground is ok if you just want somewhere your kids can have a go on the swings without worrying they'll run off.